Every Easter time of my childhood, my mother walked into Sew-N-Save. She selected three patterns, and then slipped her fingers between the raw edges of fabric to find the perfect material for three dresses. Finally, she searched for notions and pushed her cart to the cutting table. Back home, her Brother sewing machine hummed morning, noon, and night until she approved the final fittings for my sisters and me. She completed our ensembles with hats, gloves, and shiny black patent shoes and white socks with lacy trim. 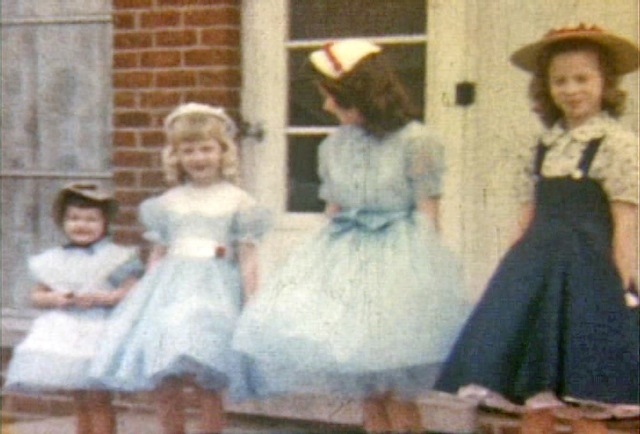 Eventually, our baby sister followed our Easter parade, tallest to shortest, out the front door to shiver on the porch while Dad filmed home movies. Once released, we twirled around and round in our dresses and can-cans. Year after year, our neighbors observed the O’Brien girls grow out of our crinolines into hose, heels, A-line skirts, and purses we held like Mom did hers. I imagine the Rivards across the street laughed at my tantrum the Sunday I refused to claim that awful, bowler straw hat. Sadly, before the fifth O’Brien daughter could join our Easter parade, our parents divorced. Soon after, in birth order, the first three girls began our leaving and marrying. In not too distant a time and place, we commenced our sewing. One visit to my mother-in-law’s home, AKA Grandma Rosie’s, she carried a portable sewing machine to our car. “To sew for the girls,” she said. I followed my mother’s footsteps into Sew-N-Save, slid my fingers between raw edges and sewed my best. The only Easter we resided in Plum Borough, Pennsylvania, I dared sew matching dresses, coats, and bonnets for my youngest two. What frustration to line a coat! And Mom made it look easy, like she did every domestic art. Grandma Rosie loved to mail Fanny Farmer chocolate bunnies and eggs to fill our daughters’ baskets. The girls were thrilled to consider Grandma Rosie their Easter Bunny. My mother-in-law also shipped darling handmade personalized ceramic ducks for each daughter and filled the wagon they pull with foil-wrapped chocolates. In birth order, my girls eventually shed their anklets for pantyhose and heels—my turn to endure that constant, awkward leaving and letting go. What seemed impossible, doctors diagnosed my resilient and gifted mother with Alzheimer’s. We cared for Mom in our home for her last Lenten season. Of all Grandma Rosie’s critters, she loved Harriett best. It takes a ruler of the home to know another. Dear Reader, while I returned Harriet and my daughter’s ducks to their perennial stations in celebration of this season, I pondered the source of my mother’s and mother-in-law’s labor of love for their children and grandchildren. The only explanation is their faith in the crucifixion and resurrection of Jesus Christ. I am witness. In their last breath, He was their hope, joy, and strength. We can trust the one who died for us.